Centre Cut Steak, Mash Potato, Green Beans Carrots & Peppercorn Sauce. 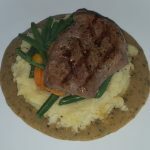 Cook Centre Cut Steak on George Forman for 3-4 Minutes on each side. Place Mash in Microwave for 90 Seconds to soften up then add Fake Butter, Salt & Pepper. Add Green Beans & Carrots to a Microwave safe dish (cup) in Water and heat for 1 Minute. Boil Kettle and add 65ml Boiling Water to 10g (x2 teaspoon) Peppercorn Sauce Granules. Place Mash & Cup of Veg in Microwave for another 1-2 Minutes. Beans & Carrots are now ready so empty Water then tip onto a Kitchen Roll (on counter) to get rid of any spare Water and give Mash a Final Stir. 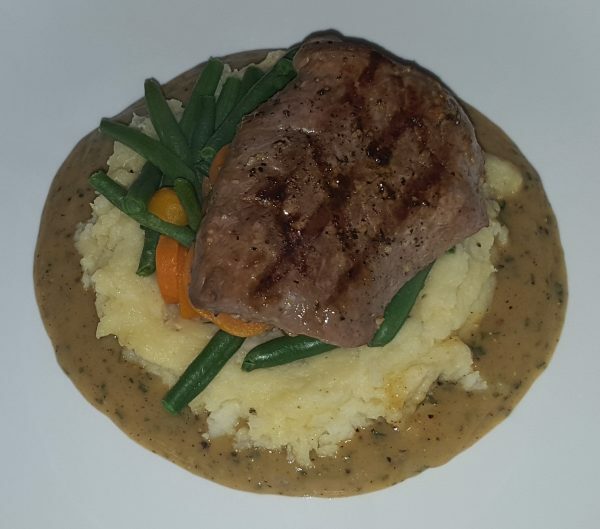 Steak is now ready so add a little more water to Peppercorn Sauce then pour onto a plate with the Mash then the Green Beans & Carrots followed by Steak on top.